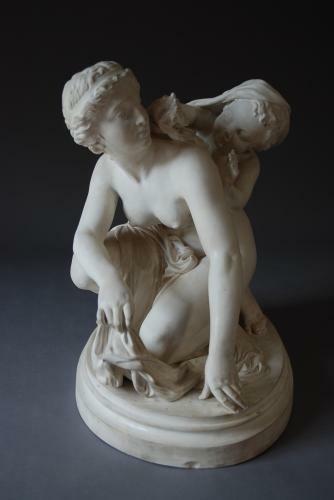 A large 19thc Copeland Parian figure of a female figure & child, signed Ericsson 1868. The child is playing with the hair of the crouching female. This a large, well modelled highly decorative piece. There is slight damage to the little finger on the right hand of the child & it has slight discolouration to the surface. Despite this, it is rare to find a piece of this size and quality. This would have graced an important property in the Victorian era. There is a smiliar but much larger marble sculpture in The Fitzwilliam Museum in Cambridge.